2017 was an exceptional year for the global economy and the stock markets. The major equity markets stand at or near record highs and economic growth is accelerating as we begin the New Year. In the U.S., the economy is on solid footing, economic growth has accelerated over the past several quarters and we enter 2018 poised for continued expansion. The primary economic indicators suggest continued growth through 2018. For example, the Conference Board’s Index of Leading Economic Indicators continues to hit new highs, consumers are optimistic with Consumer Confidence at a new recovery high, and the labor market is healthy with a 4% unemployment rate and jobless claims hitting their lowest level since the early 1970s. These all suggest that the economy is poised for continued growth in 2018, which bodes well for the global equity markets. Our view of the markets remains that we are still within the context of a long-term secular bull market in stocks. We are now almost nine years into this bull market, and if history is any guide, we may only be halfway through this long-term bullish trend. We expect U.S. stocks to post mid to upper single digit gains for the year, with a target of 2900 on the S&P 500. However, following last year’s unprecedented streak without any meaningful corrections and the lack of volatility, we expect to see an upturn in volatility and a return of more normal market corrections. Since we don’t see a recession on the horizon, any correction should be shorter and shallower and set the market up for additional gains. In the fixed income markets, we currently favor credit over duration, as continued growth is supportive to risk assets. As always, we are mindful of risks. 2018 is a midterm election year, and historically midterm election years have experienced a decent correction in the middle of the year, but those corrections have also set the stage for very strong rebound rallies. Other areas of risk include valuations, earnings growth expectations, the path of monetary policy, a new Federal Reserve Chairman, and geopolitical issues to name just a few. Valuations are again stretched, which could cap further upside gains. The Federal Reserve has now hiked interest rates five times in this cycle and plans to continue to hike rates in 2018. An overly aggressive Fed coupled with stretched valuations is a concern as we enter the New Year. Finally, we will see new leadership at the helm of the Federal Reserve and historically the market has tested new Fed Chairs within six months of their taking control. Although there are risks to be mindful of as we begin the New Year, we believe 2018 will be a positive year for the markets. The U.S. economic expansion is now eight and a half years old, making it one of the longest in U.S. history. And it shows no signs of slowing down. In fact, the economy has accelerated. Over the past three quarters, the economy has grown 1.2%, 3.1% and 3.2%. The latest tracking estimates indicate we are entering the New Year with a considerable amount of momentum. We believe the tax legislation will add about 0.4% incremental growth to both 2018 and 2019. Part of the reason we anticipate stronger growth is that we don’t see a monetary offset to the fiscal easing. Even though we expect the Fed to hike rates three times in 2018, we don’t think rates will begin to bite into economic growth. We see no evidence of any meaningful economic weakness and expect the expansion to continue into 2019. Global growth should exceed U.S. growth. We expect the global economy to grow by 3.7% in 2018, which would be the strongest since 2011. Growth overseas is broad-based with the emerging market economies leading the way, followed by a resurgence in Japan and the European economies. The Global Industrial Production chart shows just how broad-based growth is. For example, the share of individual-country purchasing manager indexes in expansion territory jumped to 97%, the largest percentage since June 2007. 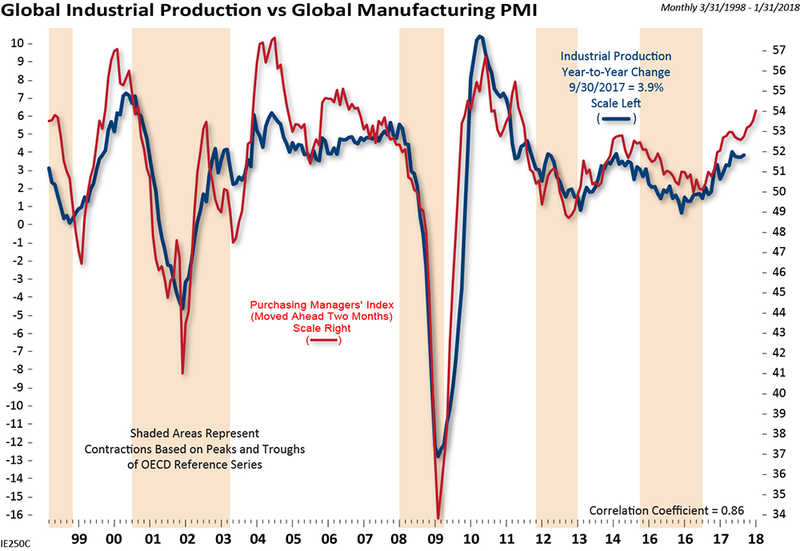 And the global purchasing managers index has risen for five straight months to its highest level since March 2011. This helps to illustrate that we are in the midst of a synchronized global growth environment and that growth is not only accelerating in the U.S. but overseas as well. For the U.S., we put a lot of stock in several indicators when assessing the economic outlook. Those are: the Conference Board’s Index of Leading Economic Indicators, first time unemployment claims and the shape of the yield curve. All three of those indicators point to continued economic growth. Let’s take a look at each one. 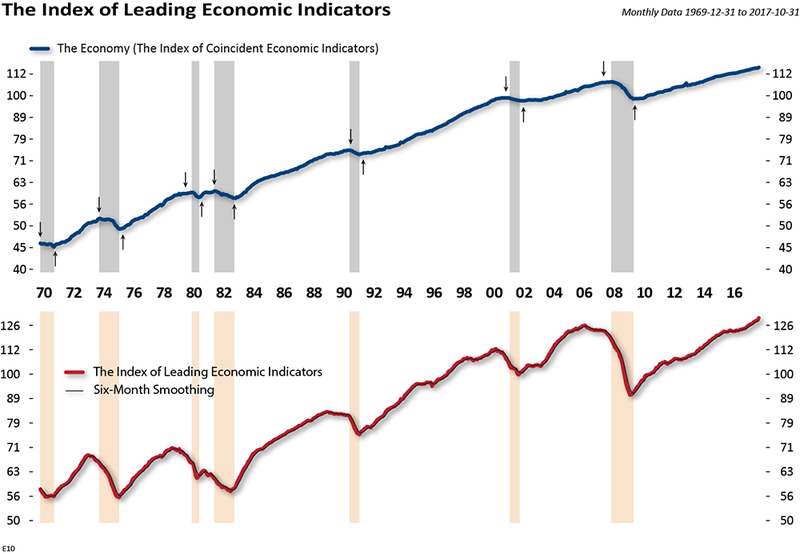 The Conference Board’s Index of Leading Economic Indicators (LEI) has risen to an all-time high. The six month rate of change of the LEI picked up to 3.0%, the fastest pace since October 2014. In addition, the LEI rose 5.5% year-over-year, more than double the historic 2.2% gain per annum. Both of these characteristics suggest strong upside momentum for the economy and are consistent with above-trend growth. 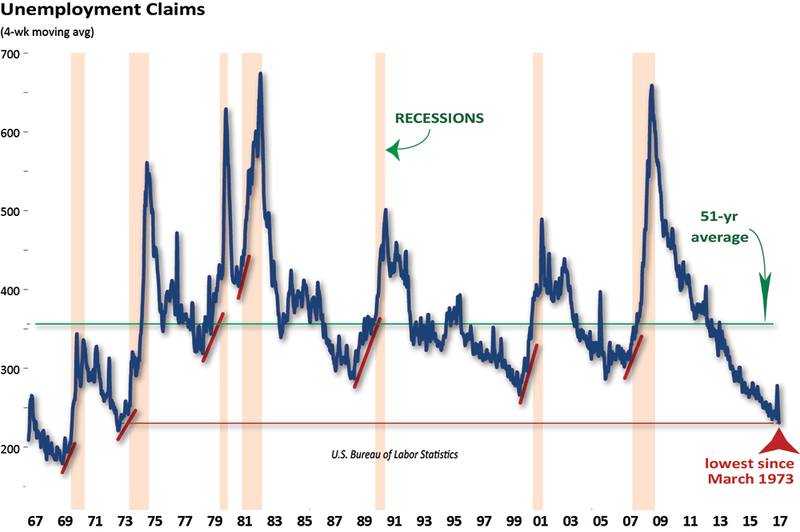 We put a lot of emphasis on the Index of Leading Economic Indicators because over the past 50-plus years, early weakness in the leading indicators index has preceded every recession in the U.S. The typical lead time between the peak in leading indicators and the start of recessions has ranged between four and 21 months. Since 1960, the average lead time has exceeded 11 months. Finally, prior to the last three recessions to hit the U.S. economy, leading indicators were declining for an average of 16 months. We are not seeing any weakness currently in the LEI, and if history is any guide, the U.S. economy should continue its expansion beyond 2018. One last bit of good news for the economy from the LEI is the ratio of leading to coincident indicators, which hit its highest reading since September 2007. While the ten-year high in this ratio is noteworthy, its direction is even more important. Going back to 1959, every recession was preceded by a declining ratio, with peaks in the ratio usually occurring more than a year before the start of a recession. With that in mind, the current recovery high in this ratio suggests that any possible recession is likely to be at least a year or more away. Another indicator that is signaling continued expansion is the number of new claims for unemployment benefits. Typically, unemployment claims start rising about six to 12 months prior to the start of a recession (red lines on graph). The four-week moving average of jobless claims recently hit its lowest level since March 1973, a 44-year low, which is consistent with continued growth in the economy as well as a tightening in the labor market. As such, we are closely watching average hourly earnings and average weekly earnings. Bull markets and economic cycle peaks often occur in a fairly predictable manner. The economy begins to grow above potential with inflation starting to rise and the Fed hiking interest rates to keep inflation in check. This generally leads to an inverted yield curve, which makes it either unprofitable or risky for banks to lend. We project inflation will accelerate moderately to 2.4% in 2018, as tax reform is expected to boost aggregate demand at a time of low unemployment and already accelerating economic growth. We are not currently seeing evidence of the economy overheating, which would lead to even higher inflation. Our belief is that inflation is a result of too much money chasing too few goods and rising wages since labor costs represent about two-thirds of the cost of goods. We are starting to see a trend of higher compensation, with a breakout in average weekly earnings. Average weekly earnings, which includes overtime pay, have risen 3.1% year-over-year, confirming the uptrend in average hourly earnings. There has been a lot of talk about the flattening of the yield curve and while an inverted curve would certainly be a huge concern, we are not there yet, nor do we see it happening in 2018. However, the yield curve has undergone some substantial flattening, and we do expect the flattening trend to continue as the Fed hikes short-term rates. The long end of the curve will likely remain more anchored than the short end, due to growing concerns about the eventual impact of the rate hikes on the economy. One caveat to the flattening trend is that we also expect the overall curve to shift higher, in addition to flattening. The historical importance of the yield curve in predicting future recessions can’t be stressed enough. While there are many claiming that “this time is different” because of the Fed’s interest rate manipulation, we wouldn’t be so quick to dismiss the yield curve. It’s an indicator we are watching closely. The table shows the level of the yield curve (the difference between the yields of the 10-year Treasury – 3 month T-bills) at the start of each recession since 1962. At the start of every recession, the yield curve was under 100 bps and has been inverted by at least 16 bps in the year leading up to the recession. With the yield curve currently at 105 bps and the 52-week low of 99 bps, the economy appears to be positioned to continue growing. On average, the S&P 500 has experienced three 5% corrections a year, a 10% decline once a year, a 15% decline every two years, and a 20% or greater bear market every three years. It has now been over a year since a 5% correction and almost two years since a 10% correction. Technically the S&P 500 hasn’t had a 20% decline since the end of the financial crisis. However, it was close in 2011 during the U.S. debt downgrade when the S&P 500 declined just over 19%. Even if we count that as a 20% decline, it has still been over six years. We have been in a period of record low volatility along with the major indices hitting new record highs on almost a daily basis. For example, in 2017 the Dow Jones Industrial Average hit 71 new all-time highs, that is one almost every three and a half trading days. The S&P saw 66 new record highs last year, historically the second most in any year (only 1995 had more with 82 new highs). This is important when considering 2018 as there is a modest positive relationship between a given year’s all-time high count and the next year’s performance, and readings above 56 new highs have never been followed by negative returns over the ensuing 12 months. As just mentioned, it’s been over a year since there was even a modest correction! The lack of volatility has been evident in the disappearance of normal corrections. According to S&P 500 data since 1928, this remains the longest period without a 3% correction and is on the verge of becoming the longest without a 5% correction. Over the S&P 500’s 90-year history, the index’s median maximum correction has been 13.2%, nearly five times larger than last year’s maximum drop of 2.8%. In addition, the S&P has never had back-to-back years with maximum corrections of less than 6%, of which there were nine prior to 2017. After each of those years, the maximum correction increased, with the median a 9.2% decline. While that’s still lower than the median maximum correction for all 90 years, the market’s gain in that following year has dropped in each case too, down from a median gain of 24.7% in years with the small corrections to a median of an 8.5% gain in the following year. We have analyzed market corrections noting those corrections that were accompanied by a recession and those that were not. The distinction is important. Stock market declines are shorter and shallower when they have not coincided with recessions. Our baseline expectations are for continued economic growth, with no recession on the horizon. Data since 1968 shows that the median non-recession bear market has suffered an average 19% decline and lasted seven months. The median recession bear market has suffered an average 30% decline and lasted 18 months. Every correction we have had since the secular bull began in 2009 was a non-recession decline and of the shallower and shorter variety. Given our baseline expectation of continued economic growth and return of normal corrections, we would expect any corrections over the intermediate-term to be shorter and shallower. The Ned Davis Research Cycle Composite has helped shape our Outlooks in the past. The Cycle Composite is a combination of the market’s historical one-, four-, and ten-year cycles combined into a single composite. It serves to provide a possible roadmap of how the market may trade. 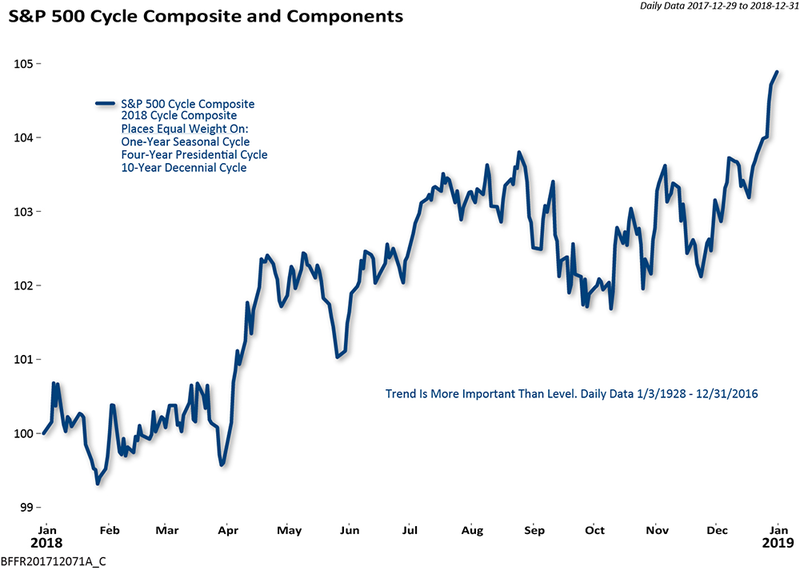 The Cycle Composite for this year, the top blue line on the chart, suggests a positive trend into the middle of the year, followed by a correction into the mid-term election time frame, then a furious rally into yearend. We have studied every mid-term election year dating back to the 1930s. History shows that the market has endured a 21% correction on average into the mid-term election year lows. The silver lining to this is that the market has also historically rebounded very strongly from those mid-term lows into a high the very next year. The average gain from the mid-term low to the high point in the following year is 47%. Naturally, the years accompanied by a recession have had steeper declines, 31% on average, than those with continued economic growth, which had 17% on average. As mentioned above, our best case scenario is that the economy continues to grow into at least 2019, so if we did get the normal mid-term election year correction, we would expect it to be of the mild variety. 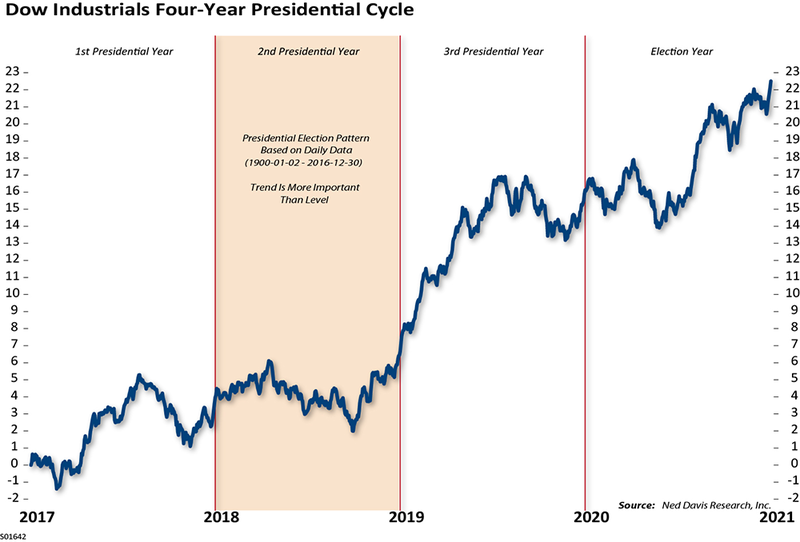 The chart shows the historical trend of the market during the four years of the Presidential Cycle. We are currently in the second year of the term (the shaded zone), and the chart shows the same possible middle of the year weakness that the Cycle Composite showed. As mentioned, historically the markets have had a decent correction in the mid-term year but have ended higher with very strong gains following those corrections. The average post World War II gain for the S&P 500 in the mid-term election year is 6.7%, and the median gain is 11.4%. In addition, the mid-term election year is the second strongest of the four-year cycle. Given the lack of volatility, mid-term election trends and historical market performance after years with small corrections, our yearend target for the S&P 500 is 2900, which would be an almost 8.5% gain for the year. However, as mentioned, we do expect a return of both volatility and normal market corrections. That volatility is likely to present itself with the normal mid-term election year correction. On the foreign front, international stocks finally outperformed U.S. stocks in 2017. On a total return basis, the S&P 500 was up 21.82% and the MSCI All Country World ex USA Index was up 27.19%. It was the first year since 2009 that international stocks outperformed U.S. stocks. The relative outperformance of U.S versus international tends to come in streaks. While one year of international outperformance doesn’t make a confirmed trend, we do believe that international stocks are poised to outperform again in 2018 based on a more favorable valuation landscape, lower interest rate environment overseas, stronger overseas economic growth, global synchronized economic growth, and inverse correlations to the U.S. dollar. Turning to taxes, this table shows the major legislative changes to the tax code over the past 53 years, along with the stock market’s response from the time those revisions were signed into law. In most cases, Wall Street’s reaction was positive, regardless of whether taxes were increased or decreased. 12/22/2017 Trump Cut ? ? ? ? ? The two exceptions to the generally positive outcomes were the market losses following the Reagan tax cuts in 1981 and the Bush cuts in 2001. Both were significant rewrites of the existing tax code. The major difference in those years was the economic situation, which was already tilting into recession, and reducing taxes could not save either the economy or the market from the pending downturns. In the current case, our baseline expectations are for continued expansion through the year, as the primary economic indicators we look at are not showing any sign of a recession on the horizon, so the tax cuts could provide a lift. But it is not without risks, especially if any economic stimulus results in an increase in inflation, which could pressure the Fed to act more aggressively or feel behind the curve and then accelerate the pace of rate hikes. That would be a detriment to both the market and the economy. In the Market Outlooks that we have done over the past couple of years we have said that “Our single biggest concern continues to be stretched valuations.” Here we are again, valuations are on the list of risks we see for 2018. Other risks include the potential for earnings growth disappointment, the path of monetary policy, a new Federal Reserve Chairman, and geopolitical issues. Let’s look at valuation first. The median P/E ratio for the S&P 500 is 25.2. That means half of the stocks in the S&P 500 are trading at higher than 25 times earnings. The only time it has been higher was in the late 1990s /early 2000s. As we’ve said before, valuations can and have remained stretched for extended periods so they are not timing tools but more a measure to assess potential risks. 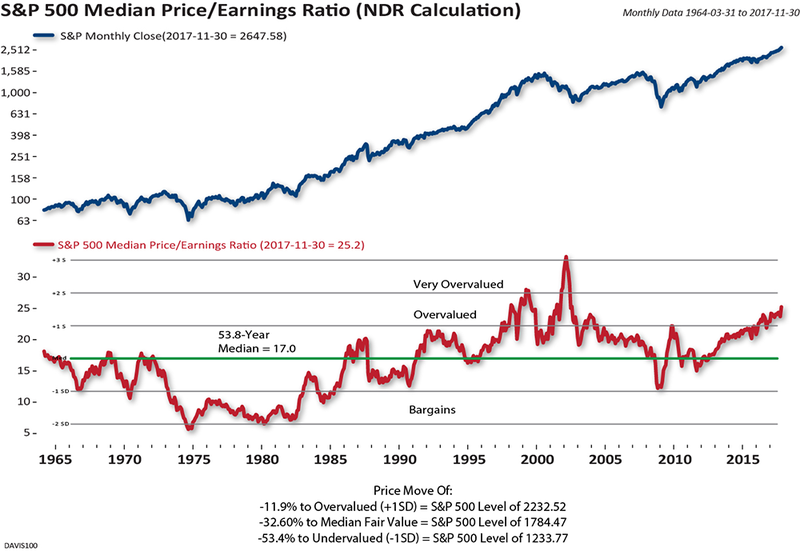 Our conclusion is the same as in the past several years, stretched valuations don’t necessarily mean that a bear market is imminent, but valuation risk is high and earnings growth becomes even more important. In 2017, strong earnings growth enabled multiples to stay roughly flat. In 2018, tax-cut induced earnings could enable multiples to contract even as the market posts additional gains. Currently market expectations are calling for 10.1% earnings growth in 2018, which seems reasonable given the economic environment and a potential earnings boost from tax reform. If earnings growth falls short of expectations, the valuation concerns would likely be a bigger headwind for the market as the year progresses. Right now, that is not our expectation, and we expect earnings growth to support valuations. In fact, we could see P/Es contract a bit in 2018, given our expectations for mid single digit gains for the market along with stronger earnings growth. The Federal Reserve will have a new Chairman in a few weeks when Jerome Powell takes over as chair. 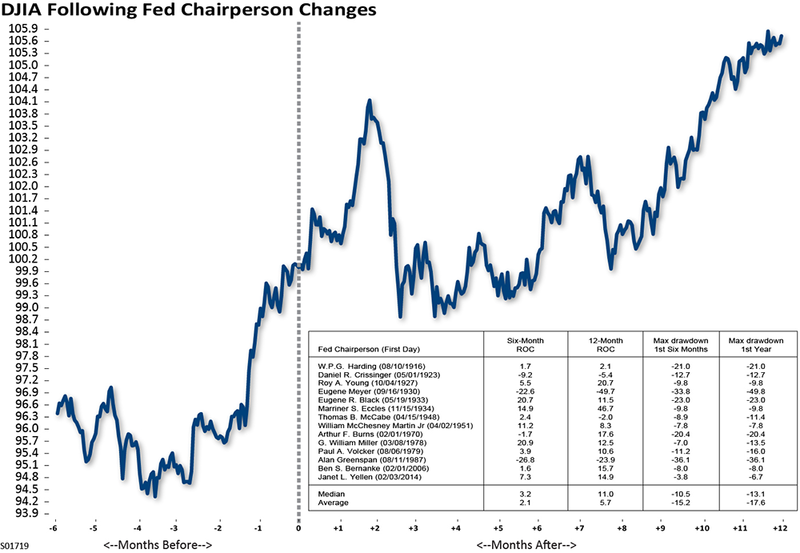 The chart shows that in the past the stock market has experienced turbulence while adjusting to a new Fed chair. During the first six months of a new Fed Chair’s reign, the Dow Jones Industrials have gained an average of only 2.1%. In addition, the average maximum drawdown has been -15.2%, while the median maximum drawdown, probably a more representative statistic given the dispersion in the data, is -10.5%. Powell is widely viewed as a centrist. Whether that leads to a continuation of the historically low volatility experienced over the past 18 months under Yellen remains to be seen, but history suggests that the markets will test Powell early in his term. This, with the normal mid-term election year decline statistics, suggests a correction at some point in 2018, but any correction should be viewed in the context of a longer-term secular bull market. As mentioned above, the yield curve flattened significantly in 2017 as the Fed hiked short-term rates and the long end remained anchored and barely budged. Coming into last year the yield curve (10-year Treasury – 3 month T-bills) was 194 bps. Today the yield curve is 105 bps. That is a flattening of 89 bps last year, largely driven by the Fed’s three rate hikes in 2017. Today, the 10-year Treasury is yielding 2.48% and is hitting the top end of a range that it has been in since 2014. Our expectations are for a modest rise in the 10-year Treasury yield to 2.75%. The Federal Reserve has now hiked rates five times in this tightening cycle, once in 2015, once in 2016, and three times in 2017. Current market expectations call for three to four more hikes in 2018 and three more in 2019. According to the Fed, their median dots projections show a 3.0% Fed Funds rate for 2020. Our expectations are for an additional three hikes in 2018 and a terminal rate in 2019 lower than the Fed’s 3.0% projection. 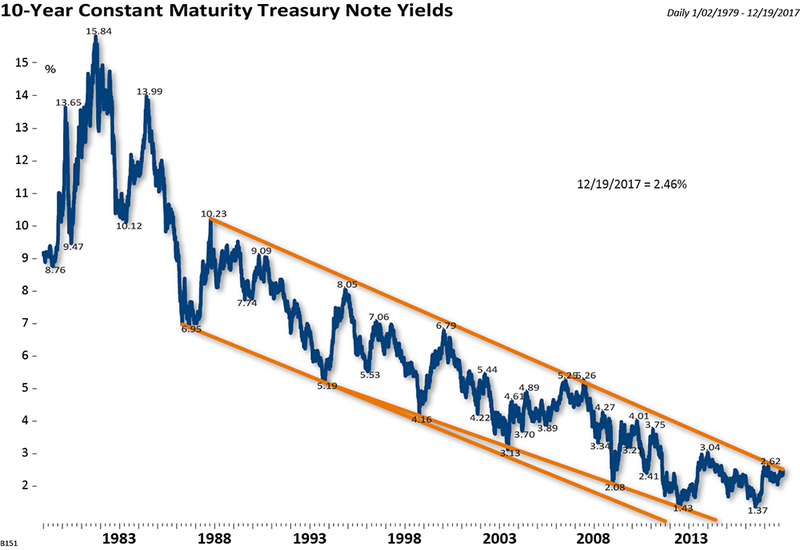 Eventually the rate hikes will begin to bite and result in slower economic growth and slower growth longer term resulting in lower long-term rates. We begin the New Year continuing to favor credit over duration, and as such are fully exposed to high yield in the Fixed Income Total Return portfolio. Credit has been favored for over 22 months. During that period, high yield has outperformed strongly. Since we entered high yield on February 2, 2016, the Bloomberg Barclays High Yield Index has gained 27.25%, while the Bloomberg Barclays Aggregate Bond Index has gained 4.10%, and the Bloomberg Barclays 7-10 Year Treasury Index has declined 1.02%. Spreads have contracted dramatically, closing the year at 331 bps, down from 368 bps at the end of 2016 and significantly lower from the peak at 840 bps in February 2016. We do not expect to see the same surge in credit as we saw over the past two years as spreads are already below their long-term average of 495 bps. 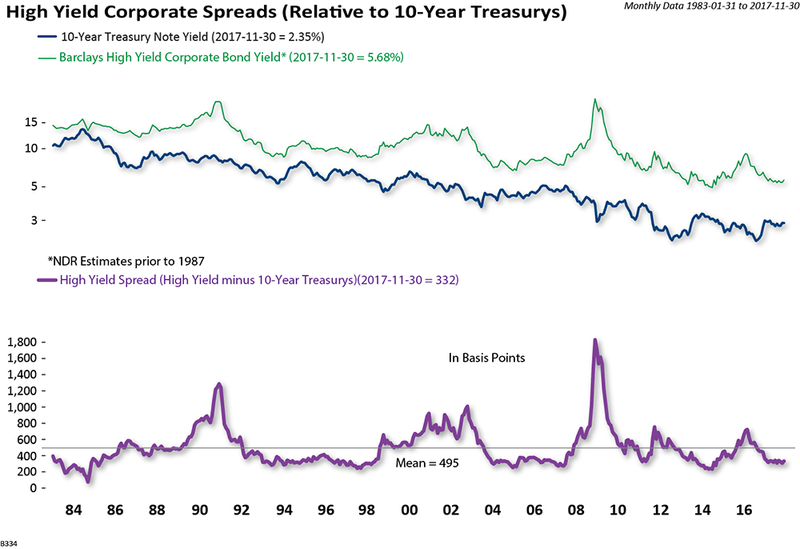 But history shows spreads can remain tight for long periods of time without an economic downturn. The below investment grade credit space still has a nice yield advantage over other fixed income sectors, and we are comfortable remaining allocated to credit as the economic outlook remains supportive. As mentioned, our long-term view is that we are in a secular bull market in stocks. Stocks are expensive in absolute terms based on P/E multiples, price to book ratios, and almost any valuation metric. However, on a relative valuation basis, stocks still look relatively cheap compared to bonds. 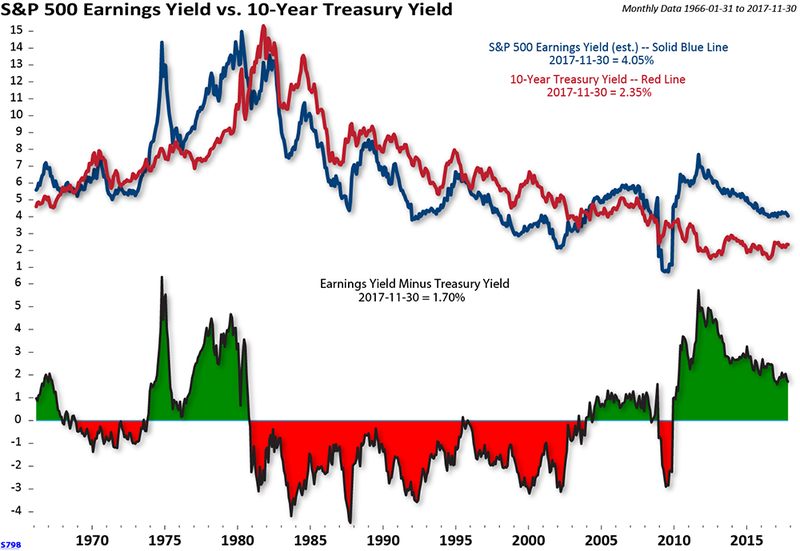 Comparing the relative valuation of stocks to bonds using the S&P 500 earnings yields and the 10-year Treasury yield, stocks are easily undervalued compared to bonds. This relative valuation gap between stocks and bonds offers a long-term leg of support for the market and supports our view of a secular upswing in stocks. Over the past 10 years, the S&P 500 is up 120% and the Bloomberg Barclays Long Term Treasury Bond Index is up 94%. The performance dispersion between stocks versus bonds is still well below its historic mean. Stocks normally outperform bonds by a wide margin over rolling 10-year periods. 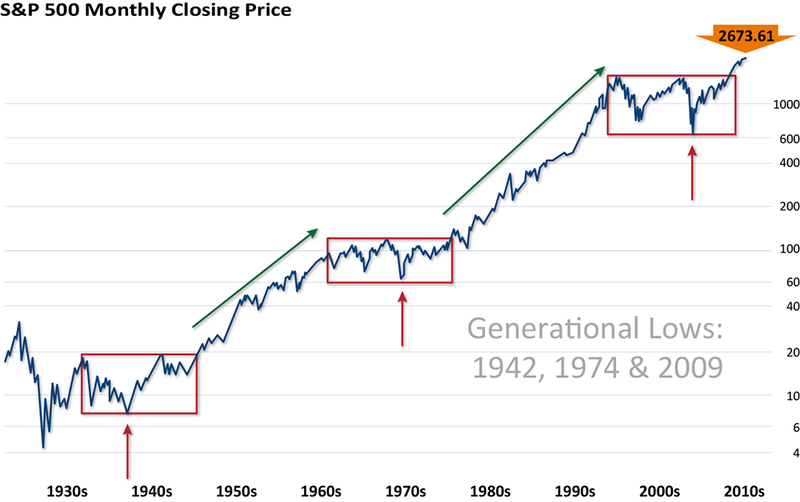 There have been a few cases where the opposite happened, and bonds outperformed stocks, such as near the beginning of new secular bull markets in the 1940s and late 70s, early 80s, and again at the beginning of this secular trend in 2009. In each of the prior instances, stocks went on to dramatically outperform bonds over subsequent 10-year periods. We are still coming off a period where bonds outperformed stocks but nowhere near the relative outperformance experienced at prior secular bull peaks. This is another long-term supporting factor in favor of a continued secular bull market in stocks. Stocks are likely to outperform bonds for an extended period. To take a very long-term view, this is a chart of the S&P 500 back into the 1920s. The three boxes in red highlight the last three secular bear markets. Of note is that once the market eclipsed its prior secular peak, it continued higher for many years. The prior two secular bull runs lasted 22 and 18 years. We believe that is like today’s environment. We are now almost nine years into this bull market, and if history is any guide, we may only be halfway through this long-term bullish trend. 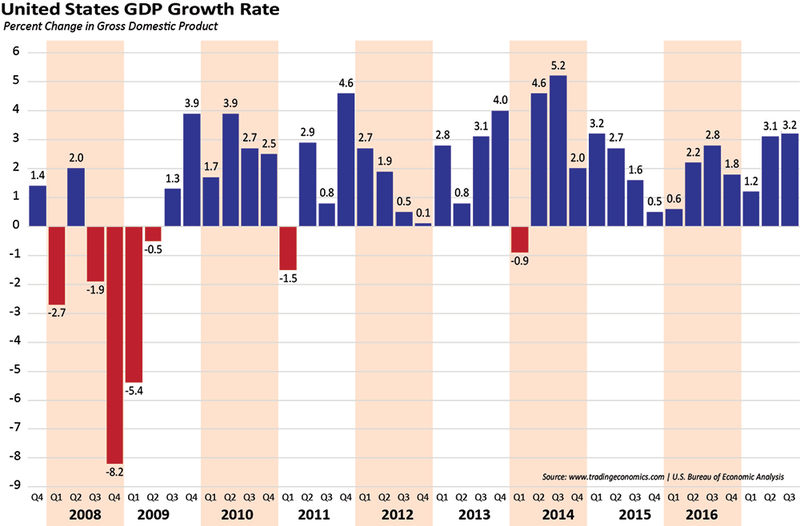 In conclusion,The U.S. economy has accelerated over the past several quarters. We expect that economic momentum to carry into 2018 and look for 3.0% economic growth. Our view of the markets remains that we are still within the context of a long-term secular bull market in stocks. We expect U.S. stocks to post mid to upper single-digit gains for the year, with a target of 2900 on the S&P 500. However, following last year’s unprecedented streak without any meaningful corrections and lack of volatility, we expect to see an upturn in volatility and a return of more normal market corrections. Since we don’t see a recession on the horizon, any correction should be shorter and shallower and set the market up for additional gains. In the fixed income markets, we currently favor credit over duration, as continued growth is supportive to risk assets. As always, there are risks to the outlook. 2018 is a mid-term election year, and historically midterm election years have experienced a decent correction in the middle of the year, but those corrections have also set the stage for very strong rebound rallies. Of concern are valuations and earnings growth. The path of monetary policy and a new Federal Reserve Chairman could impact the markets, and of course, there are always geopolitical issues. Forward-looking statements are not guaranteed. The discussions, outlook and viewpoints featured are not intended to be investment advice and do not take into account specific client investment objectives. Barclays 7-10 Year Treasury Index tracks the investment results of an index composed of U.S. Treasury bonds with remaining maturities between seven to ten years. Barclays 20+ Year Treasury Index tracks the investment results of an index composed of U.S. Treasury bonds with remaining maturities greater than 20 years. S&P GSCI Index is an unmanaged world production-weighted index composed of the principal physical commodities that are the subject of active, liquid futures markets. S&P GSCI Industrial Metals Index is considered representative of investment performance in the industrial metals market. The Value Line Arithmetic Composite Index uses the arithmetic mean change in the index reflects change if a portfolio of stocks in equal amounts were held. The S&P MidCap 400 Index measures the performance of mid-sized companies, reflecting the distinctive risk and return characteristics of that market. The S&P Small Cap 600® measures the small-cap segment of the U.S. equity market being designed to track companies that meet criteria showing that they are liquid and financially viable. Barclays U.S. Government/Credit Bond Index measures the performance of U.S. dollar denominated U.S. Treasuries and government-related & investment grade U.S. Corporate securities that have a remaining maturity of greater than one year. The iPath® S&P 500 Dynamic VIX ETN is designed to provide investors with exposure to the S&P 500® Dynamic VIX Futures™ Total Return Index. The S&P 500® Dynamic VIX Futures™ Total Return Index (the “Index”) is designed to dynamically allocate between the S&P 500® VIX Short-Term Futures™ Index Excess Return and the S&P 500® VIX Mid-Term Futures™ Index Excess Return by monitoring the steepness of the implied volatility curve. The Index seeks to react positively to overall increases in market volatility and aims to lower the roll cost of investments linked to future implied volatility.